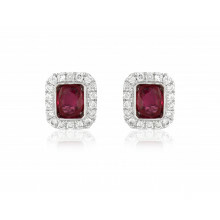 This deep red Ruby is the birthstone for July and symbolises everlasting love and passion. Rubies were once deemed more valuable and beautiful than Diamonds and it's clear to see why in these elegant, timeless studs. A classic design which has been executed here by highly skilled jewellers.